Looking for a gold-encased, diamond-encrusted iPhone and willing to pay Dh50,000 plus for the sheer pleasure that comes with owning one? Or, do your preferences run more towards giving — and receiving — gifts in bespoke wrapping? All of these fancies can be indulged in Dubai through the rarefied world of ‘speciality retail’. And it is not global brands that are muscling their way into this niche but Dubai-centred businesses. Select locations for its highly customised services is also the tack Amodoria — which is into accessorising bling onto iPhones or any other model that catches the fancy of the well-heeled — follows to perfection. It is also the reason why the promoters are biding their time to set up their own stores; instead Amodoria is offering the services through locations in upscale hotels — Emirates Palace is one — and department stores. “We are planning to launch our own anchor stores in Dubai, Abu Dhabi, London and Florence over the coming year — however, as a start-up this often takes longer as it requires finding the right space,” said Dadkarim Mulla, co-founder and CEO. “The hotel groups we are retailing with have given us the space and chance to enter the market with relative ease in cost and time. 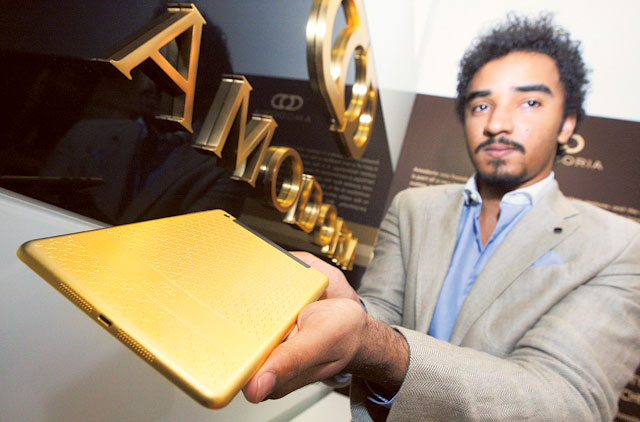 Certainly, for its accessorising, Amodoria does not seem to be holding back — The entry collection of iPhones itself starts at a steep Dh20,000 given that it comes in five grams of fine gold detailed in a signature pattern and a Quintessentially concierge membership for a year. The ‘Limited Gulf Edition’ iPhone is available at Dh55,000, with the gold content scaled up to 35 grams, plus 3.75 carats of diamonds and a signature gold falcon embedded on the frame. “Gold is the preferred finish in the GCC and emerging markets, [but] it is not what our company has set out to manufacture as the main line for our expansion plans,” said Mulla. “The bespoke Apple products were only a launch platform for our brand to exemplify what we can do in the luxury industry. Aysha of Wrapt reckons that being a niche player does not necessarily mean a closed mindset on future possibilities. “The word “niche marketing” means a gap in the marketplace that needs to be filled,” said Aysha. “Some marketers believe niche service providers should continue to maintain a boutique-style approach and their target remains small — this is the most common practice. However, niche retail is not limited to niche markets. Outside of the UAE, Wrapt has wrapped up a presence in in Qatar with two stores and in Oman. It will open up a store in Kuwait within the next six months. “In the UAE we have stores and kiosks operating in various malls — this is an added value to malls who now offer their customers premium gift-wrapping and packaging solutions,” said Aysha. “We function well in community-based shopping centres as there is huge demand for last minute gift-wrapping services. May be so, but there is nothing like the present for speciality retailing.